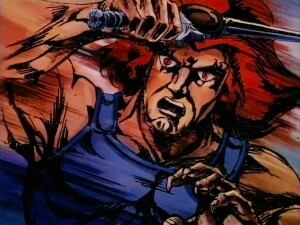 We left Lion-O in Part One being bombarded by the Berserker’s fireballs as he swam back to shore. It was a serious cliffhanger, as the seawater began to boil and Lion-O was forced down to colder depths. 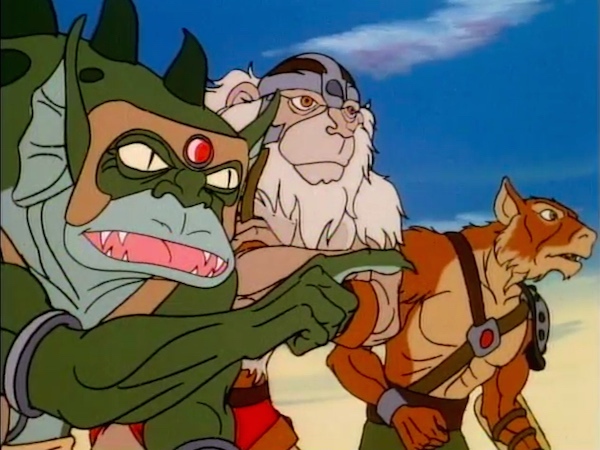 This all gets resolved in a tremendous opening sequence, featuring new music by Bernard Hoffer and Panthro swooping in on the new ThunderClaw to attack the Berserkers. Pumyra and Bengali even recognize Panthro, suggesting that the ThunderCats enjoyed celebrity status on Thundera. 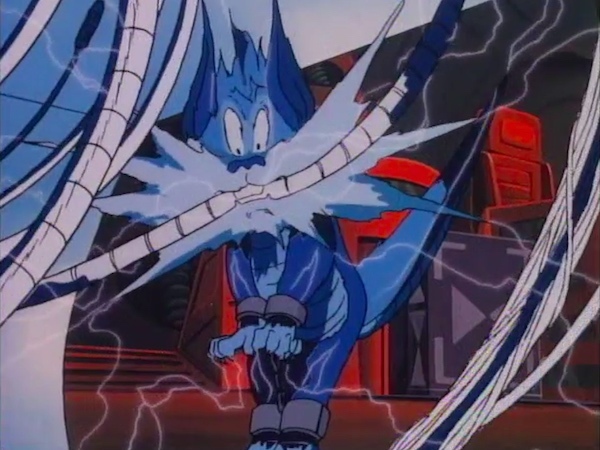 The animation is top-notch, and the story unfolds naturally: Panthro would have continued his pursuit had Snarf not alerted him to Lion-O’s predicament, which diverts his attention and gives him an opportunity to showcase the ThunderClaw’s abilities. But the baddies get away. When the Berserkers meet up with the Mutants, they fire off some fantastic insults at one another. Leonard Starr does a great job here, and elsewhere in the series, of setting up rivalries between the show’s villains. They don’t get along at all, and are only united by Mumm-Ra’s willingness to pay them. This scene also features the first of many escape attempts on the part of Lynx-O, Bengali, and Pumyra, showcasing their resourcefulness, their strength in battle, and their loyalty to one another. A few episodes from now, in Part Five, Lion-O will say that they’ve handled themselves like ThunderCats. Even though he wasn’t there to see any of it, their ongoing efforts to free themselves are the best evidence that Lion-O’s assessment is entirely correct. 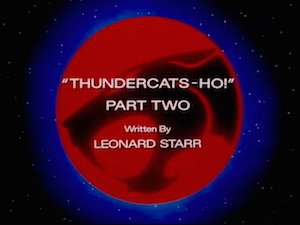 One of the first things that the “ThunderCats Ho!” five-parter brings to mind is the cast of ancillary characters who return to take part in the story. Part Two begins this call to arms, as Snowman, Ratar-O, and Captain Shiner all get in on the game. It could be that Leonard Starr was under pressure to involve these characters, since their action figures were hitting toy shelves. Indeed, none of them are his original creations; but he makes excellent use of them. Snowman is playful, even comical, in a way that we haven’t seen before, while still maintaining his personal and territorial pride. 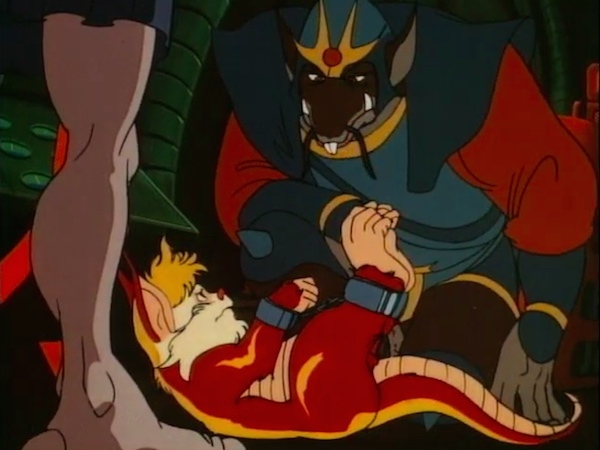 Ratar-O is also handled well—his egotism and general nastiness shine through—but Starr makes the mistake of having him capture Snarf “again”, when naturally it was Snarfer whom he captured in “Feliner”. Captain Shiner, as slippery as ever, has the stand-out guest appearance of the whole five-parter. Conning Mumm-Ra out of more money by mentioning “dangerous updrafts” is genius. The confrontation with the Thunderians onboard the Vertus is even better. At gunpoint, Shiner communicates tacitly with his pilot simply by wiggling his monocle, then disables the Vertus’ telescreen, chalking it up to “electrical failure”. The man is as brazen as they come, but his overconfidence will get the better of him in Part Five. As more characters make their way onscreen, the story begins to take strange and frustrating turns. Ratar-O’s appearance serves only to delay the ThunderCats’ principal rescue mission and move the action to Hook Mountain. 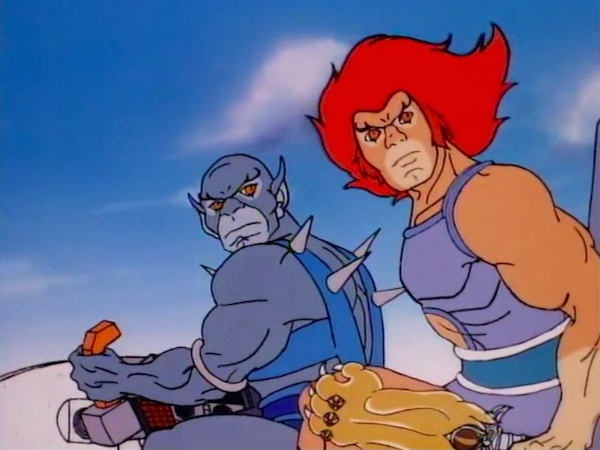 Lion-O sending Panthro back to the Lair makes little sense, since before the Ratstar’s arrival they were about to investigate Mumm-Ra’s involvement. Never mind that they spent all night hanging out at the beach. Mumm-Ra’s plan, meanwhile, remains hazy. He wants to lure the ThunderCats to Fire Rock Mountain, but he enlists multiple factions to transport the Thunderians there, going to great lengths to cover his tracks. 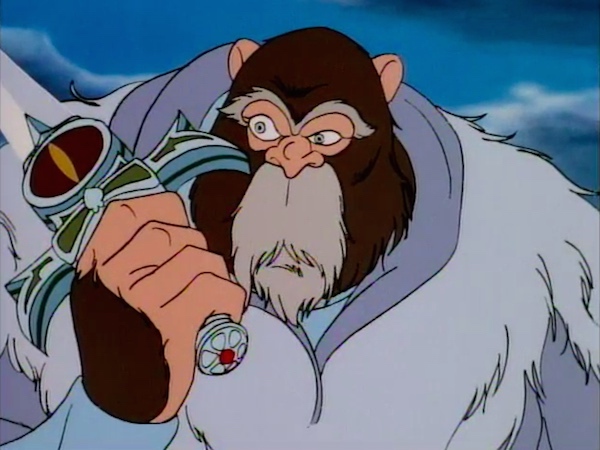 When we learn of Hammerhand’s sea approach to Fire Rock Mountain in Part Four, it makes even less sense. Part Two ends with the confrontation on Hook Mountain, after Snowman revives a shockingly blue Lion-O. 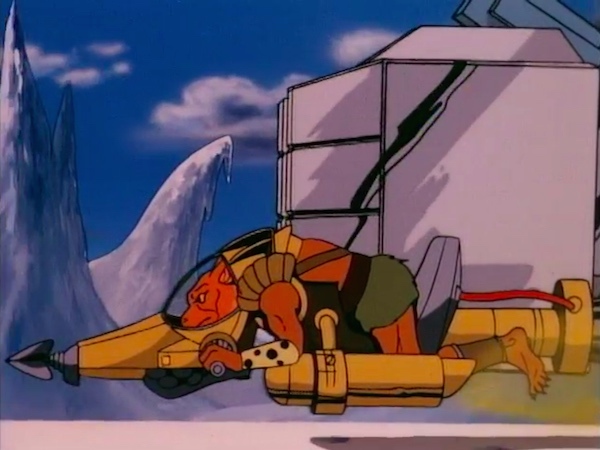 The Mutants are on their way to Fire Rock Mountain, but S-S-Slithe makes an excellent call to delay that mission in favor of attacking Lion-O while he’s injured. He may have started in the field kitchens, but S-S-Slithe’s no dummy. A new Mutant vehicle is hinted at here and then dramatically revealed—the Fistpounder—and the episode ends with the first of numerous freeze frames that will crop up in the episodes to come. Overall, this installment moves the story along, but also introduces some unwelcome—if exciting—detours for Lion-O and friends. The Thunderians’ half of the story is the better one, and not just because Captain Shiner is a badass. 1 ^ Leonard Starr gave each part a working title. Part Two’s was “Fire Rock Mountain”. 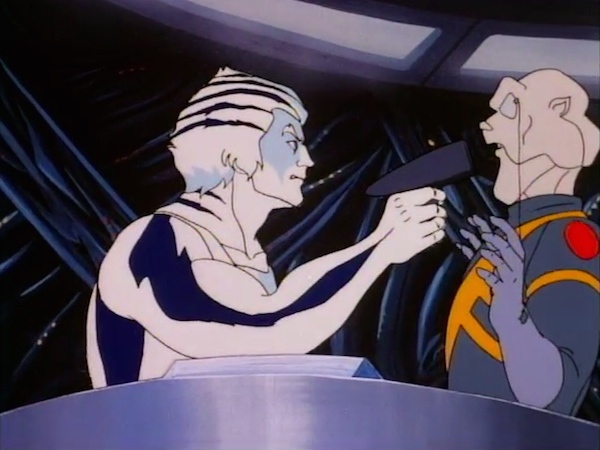 2 ^ A deleted “optional sequence” in the script features Jackalman and S-S-Slithe discussing why they aren’t being paid. S-S-Slithe seems to still be under the impression that Mumm-Ra intends to share his power with them once he’s victorious. 3 ^ This scene is absent from the movie version, which makes the Fistpounder’s appearance an even bigger surprise. 4 ^ The hints are great. First Snowman mentions “unknown vehicles moving in the valleys below”, and then we see just the Fistpounder’s fist moving in the background while Jackalman talks to S-S-Slithe over the radio. It’s a shame the Fistpounder sees such little use later in the season. 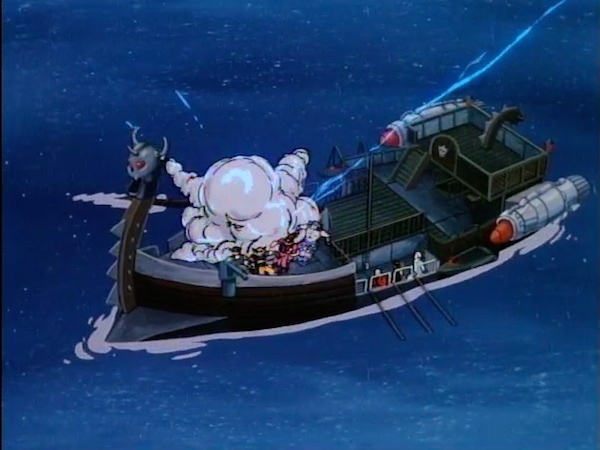 The whirlpool that Panthro generates to rescue Lion-O is animated strangely. The script makes it sound more plausible, as Lion-O is drawn up into the circular current, and Panthro is then forced to match his speed in order to pick him up. Snarf risks his life to disable the magnet and help Lion-O, continuing the theme of doing whatever it takes to help one’s friends (and, to quote the script, “lighting up like a lightbulb” in the process). Captain Shiner’s Vertus was destroyed in “Sword in a Hole”. This must be a new ship. The ThunderKittens show real character growth when they agree that being left behind at the Lair is still valuable teamwork. This episode features some great transitions: Mumm-Ra’s cape, flames in the cauldron, and the ThunderTank barreling toward camera are all used to get us from one shot to the next.